We’re eyeing O’Keefe & Merritt and Wedgewood 1950s stoves on Craig’s List and will be visiting Antique Stove Heaven again this weekend. I’d love to have a stove in time to cook Thanksgiving dinner. I’m also thinking about getting a Hoosier cabinet for the wall perpendicular to the stove; we’ve found one on Craig’s List (see a theme here?) that we want to check out. There aren’t many Hoosier cabinets in California but I think they’re neat. The walls are currently a mint green and we’ll be repainting; I don’t mind green but would pick a different color of green – I prefer more of a sage-y, yellow based green as opposed to a bluer green. Currently the nook and the kitchen are the same color; we’ll probably pick different colors just for the contrast/ separation of the rooms. Not sure if we’ll stay with green or go with an off-white for the kitchen and a warm neutral for the nook. 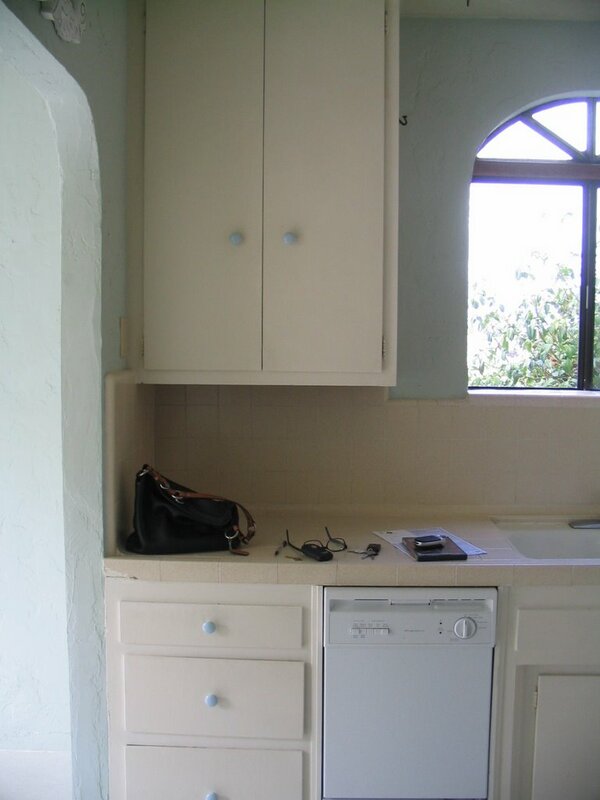 Longer-term we need to re-do the bottom cabinets, sink and countertops – there’s some water damage to the plaster wall and interior of the cabinets, the sinks are very rusty from the bottom. We may add (and hide) a full size dishwasher, but we’ve lived without a dishwasher for a very long time (can’t remember when we’ve last had a working dishwasher) so that’s not too high on the priority list (though, with an eye towards resale value, it’s something we should consider). Tile-wise, we’re thinking a classic 1920s bungalow hex & subway tile sort of thing…..maybe doing a lot of subway tile around the stove too. I’d like to do glass knobs/pulls on the cabinets and drawers. Pics of the house in it’s current condition are at my flickr page.